The Indian National Congress - INC, also commonly called the Congress is one of the major political parties in India, . It is one of the largest and oldest democratically-operating political parties in the world. The Organisation was founded during the British Colonial times in 1885. The founders included a prominent member of theTheosophical Society, Allan Octavian Hume, Dadabhai Naoroji and Dinshaw Wacha. In the following decades, the Indian National Congress became a pivotal participant in the Indian Independence Movement, with over 15 million members and over 70 million participants in its struggle against British colonial rule in India. After independence in 1947, it became the nation's dominant political party; in the 15 general elections since independence, the Congress has won an outright majority on six occasions, and has led the ruling coalition a further four times, heading the central government for a total of 49 years.There have been seven Congress Prime Ministers, the first being Jawaharlal Nehru, serving from 1947–64. Surendranath Banerjee - was born in Kolkata (Calcutta), in the province of Bengal to a Bengali Brahmin family. He founded the Indian National Association, one of the earliest Indian political organizations, and later became a senior leader of the Indian National Congress. Gopal Krishna Gokhale was born on 9 May 1866 in Kothluk village of Guhagar taluka in Ratnagiri district - Maharashtra in a Chitpavan Brahmin Family. (9 May 1866 – 19 February 1915) was one of the founding social and political leaders during the Indian Independence Movement against the British Empire in India. Gokhale was a senior leader of the Indian National Congress and founder of the Servants of India Society. Pandit Bishan Narayan Dar (1864–1916) was an Indian politician who served as the President of the Indian National Congress for one term in 1911.Dar belonged to a prominent Kashmiri Pandit brahmins. Ambica Charan Mazumdar (1850–1922) was an Bengali Indian politician who served as the president of the Indian National Congress. Vijayaraghavachariar -was born on 18 June 1852 into a Vaishnavite Brahmin family in the village of Pon Vilaindha Kalathur, in the district of Chengalpattu. He entered politics as a member of the Salem Municipal Council in 1882. a civil servant and reformer, led him to be invited to the first sessions of the Indian National Congress. Once within the Congress, he rose to serve as its president in 1920. He played a key role in framing the Swaraj Constitution. He also was part of the Propaganda Committee of the Congress and thus served in spreading the ideologies of the party to the masses. Apart from his role in the Congress, he also served as the president of Hindu Mahasabha, a Hindu nationalist party, in 1931. Seshadri Srinivasa Iyengar - (11 September 1874 – 19 May 1941), was an Indian lawyer, freedom-fighter and politician from the Indian National Congress& then leader. Dr Bhogaraju Pattabhi Sitaramayya - (November 24, 1880 – December 17, 1959) was born in a Telugu Niyogi Brahmin family inGundugolanu village, Krishna district (now part of West Godavari district) in Andhra Pradesh, was an Indian independence activist and political leader in the state of Andhra Pradesh. Shankar Dayal Sharma - (19 August 1918 – 26 December 1999) was the ninth President of India, serving from 1992 to 1997. Prior to his presidency, Sharma had been the eighth Vice President of India. He was also Chief Minister (1952–1956) of Bhopal, and Cabinet Minister (1956–1967), holding the portfolios of Education, Law, Public Works, Industry and Commerce, National Resources and Separate Revenue. He was the President of the Indian National Congress in 1972–1974. Dev Kant Barooah - (22 February 1914 – 28 January 1996) was an Indian politician from Assam, who served as the President of the Indian National Congress during the Emergency (1975–77). Indira Priyadarshini Gandhi - 19 November 1917 – 31 October 1984) was the fourth Prime Minister of India and a central figure of the Indian National Congress party. Gandhi, who served from 1966 to 1977 and then again from 1980. Pamulaparti Venkata Narasimha Rao -(28 June 1921 – 23 December 2004) was an Indian lawyer and politician who served as the tenth Prime Minister of India (1991–1996) who served as the President of the Indian National Congress. Dr. Sarvepalli Radhakrishnan - (1888-1975) Term of Office: 13 May 1962 to 13 May 1967. Shri Varahagiri Venkata Giri - (1894-1980) Term of Office: 3 May 1969 to 20 July 1969 and 24 August 1969 to 24 August 1974. Dr Shankar Dayal Sharma - (1918-1999) Term of Office: 25 July 1992 to 25 July 1997. Pranab Kumar Mukherjee - is the 13th and current President of India, in office since July 2012. Jawaharlal Nehru - 14 November 1889 – 27 May 1964) was the first Prime Minister of India and a central figure in Indian politics for much of the 20th century. Indira Priyadarshini Gandhi - 19 November 1917 – 31 October 1984) was the fourth Prime Minister of India and a central figure of the Indian National Congress party. Gandhi, who served from 1966 to 1977 and then again from 1980 until her assassination in 1984, is the second-longest-serving Prime Minister of India and the only woman to hold the office. Pamulaparti Venkata Narasimha Rao (28 June 1921 – 23 December 2004) was an Indian lawyer and politician who served as the tenth Prime Minister of India (1991–1996). Ganesh Vasudev Mavalankar (27 November 1888 – 27 February 1956) popularly known as Dadasaheb was an independence activist, the President (from 1946 to 1947) of the Central Legislative Assembly, then Speaker of the Constituent Assembly of India, and later the first Speaker of the Lok Sabha, the lower house of the Parliament of India. Madabhushi Ananthasayanam Ayyangar - (4 February 1891 – 19 March 1978) was the first Deputy Speaker and then Speaker of Lok Sabha in the Indian Parliament. Kawdoor Sadananda Hegde - (June 11, 1909 - May 24, 1990) is a former Speaker of the Lok Sabha, a Supreme Court Judge, and the founder of the Nitte Education Trust. He is the father of Santhosh Hegde, who was also a Judge of the Supreme Court of India. Rabi Ray (born 26 November 1926) is an Indian socialist politician, a Gandhian, a former speaker of Lok Sabha and a former Union minister ofIndia. He hails from Orissa. Shri Manohar Joshi joined this illustrious line of Presiding Officers when he was elected unanimously to the exalted position of Speaker on 10 May, 2002. He remained in office till 4 June, 2004. Shri Somnath Chatterjee- joined this illustrious line of Speakers, when he was elected unanimously to the exalted position on 4 June 2004. Sumitra Mahajan - (born 12 April 1943) is an Indian politician who has been Speaker of the Lok Sabha since 2014. She belongs to Bharatiya Janata Party. He was Deputy Leader of the Congress Party in Parliament from 1967 to 1969 and Leader of the Congress (O) Party in the Rajya Sabha from 1969 to 1971. Kamlapati Tripathi - (September 3, 1905 – 1990), the writer, journalist, editor and freedom fighter was a senior Indian National Congressleader from Varanasi constituency. He served as Leader of the Opposition three times. Arun Jaitley - (born 28 December 1952)He is also the current Leader of the House at Rajya Sabha. Gopinath Bordoloi - from Assam 1890–1950) was a Prime Minister of undivided Assam before independence and later Chief Minister of the Indian state of Assam, and also a leading Indian independence activist. Jogendra Nath Hazarika - also Known J.N. Hazarika was an Indian Politician.He was the Chief Minister of Assam from 9 September 1979 to 11 December 1979. He was elected to the Lok Sabha, lower house of the Parliament of India from the Dibrugarh constituency, Assam in 1951, 1957, 1962 and 1967. Prafulla Kumar Mahanta (born 1952) in Nagaon district in Assam, is an Indian Politician who was the leader of the Assam Movement, a former Chief Minister of Assam (two terms) and the President of the Asom Gana Parishad (AGP), a major political party in the Indian state of Assam.He became the chief minister in the state when the AGP came to power in 1985. Bishnuram Medhi - (April 24, 1888 – January 21, 1981) was an Indian politician and freedom-fighter who served as the Chief Minister of Assam from 1950 to 1957 and Governor of Madras State (now chennai districts) from January 1958 till May 1964. Hiteswar Saikia - was the chief minister of Assam for two terms, first from February 27, 1983 to December 23, 1985 and then from June 30, 1991 to April 22, 1996. He was a senior leader of the Indian National Congress. Dr. Burgula Ramakrishna Rao - Burgula Ramakrishna Rao was born in a Telugu Brahmin family in Padakallu village, Kalwakurthy taluk, Mahbubnagar district. (March 13, 1899 – September 15, 1967) was the first elected Chief Minister of the erstwhile Hyderabad State. He was among the leaders who fought against the Nizam in the princely State. Tanguturi Prakasam Pantulu - (23 August 1872 – 20 May 1957) He was born to Subbamma and Gopala Krishnaya, in a Niyogi Telugu Brahmin family, in the village of Vinodarayunipalem,he was an Indian politician and freedom fighter, Chief Minister of the Madras Presidency, and subsequently became the first Chief Minister of the new Andhra State, created by the partition of Madras State along linguistic lines. He was also known as Andhra Kesari. Pamulaparti Venkata Narasimha Rao - (28 June 1921 – 23 December 2004) He was born into a Telugu Brahmin Family, on 28 June 1921 at Lakinepally village near Narsampet in Warangal District, now in Telangana Chief Minister of Andhra Pradesh 30 September 1971 – 10 January 1973. Kedar Pandey - (December 9, 1920 - July 3, 1996) was an Indian freedom fighter and Indian National Congress politician, who remained the Chief Minister of Bihar between March 1972 to July 1973 , Minister of Railways in Union Cabinet between 12 November 1980 to 14 January 1982 Government of India. Dr. Jagannath Mishra - is an Indian politician who has been Chief Minister of Bihar and a union cabinet minister. A former Congress leader, he was elected Chief Minister of Bihar three times. After leaving Congress he joined the NCP and now is in JD(U). Bindeshwari Dubey - (14 January 1921 – 20 January 1993) was a freedom fighter and administrator who served as Chief Minister of Bihar between 25 March 1985 and 14 February 1988. Bhagwat Jha Azad - was chief minister of Bihar in India and a member of Lok Sabha. He was chief minister from 14 February 1988 to 10 March 1989. He was father of Kirti Azad, a Lok Sabha member of (BJP) and a former cricketer. Sushma Swaraj - (born 14 February 1952) She also served as 5th Chief Minister of Delhi, for a brief term in 1998. Dayanand Balkrishna Bandodkar - (12 March 1911 – 12 August 1973) was the first Chief Minister of Goa after the territory was returned to Indiaby Portugal. A wealthy mine owner, he sought to merge the territory with the state of Maharashtra. He swept the polls in 1963, 1967 and in 1972 and remained in power until his death in 1973. Shashikala Kakodkar - She is the daughter of Goa's first chief minister Dayanand Bandodkar (Bhausaheb), who ascended to power after the December 1963 elections, following a hotly contested election which saw the polarisation of the electorate on caste and religious lines. Following her father's death in 1973, while still in office, Mrs Kakodkar became the chief minister of Goa, and continued in power till being ousted by a split within her party in early 1979. Manohar Gopalkrishna Prabhu Parrikar - (born 13 December 1955) is an Indian politician from the Bharatiya Janata Party (BJP) he wasChief Minister of Goa, first from 2000 to 2005 (Goa's first BJP chief minister), and later from March 2012 to November 2014. Digambar Kamat - (born 8 March 1954) is an Indian politician. He was the Chief Minister of Goa from June 2007 to March 2012. He belongs to the Indian National Congress. Laxmikant Yashwant Parsekar - (born 4 July 1956) is an Indian politician who has been the Chief Minister of Goa, a state in India, since 2014. He is the member of the Goa Legislative Assembly from Mandrem constituency, and he belongs to the Bharatiya Janata Party. Hitendra Kanaiyalal Desai - (August 9, 1915 - September 12, 1993) was the Chief Minister of Gujarat and a leader of Indian National Congress. Bhagwat Dayal Sharma - (1918–1993), popularly known as Panditji, was the first Chief Minister of Haryana of Independent India. He was Governor of Odisha and Madhya Pradesh from 30 April 1980 to 14 May 1984. Shanta Kumar - (born 12 September 1934) is a former Chief Minister of Himachal Pradesh and a former minister in Government of India. He is a member of the Bharatiya Janata Party. R. Gundu Rao - (8 April 1937–22 August 1993) was the Chief Minister of Karnataka state from 1980 to 1983.He became the first Brahmin Chief minister of Karnataka. Ramakrishna Mahabaleshwar Hegde - (August 29, 1926 – January 12, 2004) was an Indian politician who served as the Chief Minister of Karnataka for three terms, he was elected to the Karnataka Legislative Assembly in 1957, 1962, 1967, 1983, 1985 and 1989. Elamkulam Manakkal Sankaran Namboodiripad - (13 June 1909 – 19 March 1998), popularly EMS, was an Indian communist politician and theorist, who served as the first Chief Minister of Kerala state in 1957–59 and then again in 1967–69. As a member of the Communist Party of India (CPI), he became the first non-Indian National Congress chief minister in the Indian republic. Ravishankar Shukla - (2 August 1877 – 31 December 1956) was a leader of the Indian National Congress, Indian independence movement activist, the Premier of the Central Provinces and Berar from 27 April 1946 to 25 January 1950, the first Chief Minister of Madhya Pradesh state from 26 January 1950 to 31 October 1956 and then the first chief minister of the reorganised Madhya Pradesh state from 1 November 1956 until his death on 31 December 1956. Kailash Nath Katju - (K. N. Katju) (17 June 1887 in Jaora – 17 February 1968) was a prominent politician of India. He was the Governor of Odisha and West Bengal, the Chief Minister ofMadhya Pradesh, the Union Law Minister, the Union Home Minister and the Union Defence Minister. He was also one of India's most prominent lawyers. Pt. Dwarka Prasad Mishra - (1901–1988), an Indian National Congress politician, was a Chief Minister of Madhya Pradesh. He was also a writer. 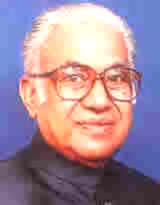 Shyama Charan Shukla - (born February 27, 1925 in Raipur, Chhattisgarh — d. February 14, 2007 in Raipur, Chhattisgarh), veteran Indian National Congress leader and served three times as Chief Minister of undivided Madhya Pradesh. Kailsh Chandra Joshi - (born 14 July 1929) is a politician belonging to Bharatiya Janata Party (BJP), and a former chief minister of the Indian state of Madhya Pradesh. He was chief minister of the state from June 1977 to January 1978 as a member of Janata Party. Balasaheb Gangadhar Kher - ( also known as B. G. Kher) August 24, 1888 – March 8, 1957) was the first chief minister (then called prime minister) of Bombay State which consisted of present day Maharastra and Gujarat States of India. Morarji Desai - (29 Feb 1896 – 10 April 1995) was a notable Indian independence activist and the fifth Prime Minister of India from 1977 to 1979. He was also the first Prime Minister to head India's first non-Congress Government. He held many important posts in the Government of Indiasuch as: Chief Minister of Bombay State, Home Minister, Finance Minister and Deputy Prime Minister of India. Manohar Gajanan Joshi - (born 2 December 1937) is an Indian politician from the state of Maharashtra. He is one of the prominent leaders of the Shiv Sena political party. He was the Chief Minister of Maharashtra from 1995–1999. Sadashiva Tripathy - (1910–1980) was an Indian politician, a leader of the Indian National Congress political party and the Chief Minister of Odisha from 21 February 1965 to 8 March 1967. Biswanath Das - (March 8, 1889 – June 2, 1984) was an Indian politician. He was the Prime Minister of Odisha Province of British India 1937–39, the Governor of Uttar Pradesh 1962–67 and later the Chief Minister of Odisha 1971–72. Nandini Satpathy -(9 June 1931 – 4 August 2006) was an Indian politician and author. She was the Chief Minister of Odishafrom June 1972 to December 1976. Binayak Acharya - (30 August 1918 - 11 December 1983) was an Indian politician and the Chief Minister of Odisha ofOdisha from 29 December 1976 to 30 April 1977. Gopi Chand Bhargava - (8 March 1889 – 1966) was the first Chief Minister of Punjab from August 15, 1947 to April 13, 1949, and again between October 18, 1949, to June 20, 1951, and for the third time between June 21, 1964, and July 6, 1964. He was member of the Congress. Cadambi Sheshachar Venkatachari - (11 July 1899 – 16 June 1999) was an Indian Civil Servant, diplomat and the Chief Minister of Rajasthan from 6 January 1951 to 25 April 1951. Jai Narayan Vyas - (1899–1963) was a chief minister of the Indian state of Rajasthan. He hailed from Jodhpur city and was a leader of Indian National Congress party. Hari Dev Joshi - (17 December 1921 – 1995) was an Indian politician and a freedom fighter. and became the leader of the Indian National Congress party in Rajasthan state in India. He was chief minister of Rajasthan at three times, first from 11 October 1973 to 29 April 1977, second time from 10 March 1985 to 20 January 1988 and finally for a short time from 4 December 1989 to 4 March 1990. Chakravarti Rajagopalachari - (10 December 1878 – 25 December 1972), informally called Rajaji was an Indian lawyer, independence activist, politician, writer and statesman. Rajagopalachari was the last Governor-General of India. He also served as leader of the Indian National Congress and as Chief Minister of Madras state from 1952 to 1954. In 1959. V. N. Janaki - When (M. G. Ramachandran her husband m.g.r. )( intercaste marriage) died in 1987, she succeeded him as the first woman Chief Minister of Tamil Nadu and the Leader of the AIADMK party (which later split into two factions). Janaki Ramachandran became Chief minister in January 1988 after her husband's death, but the government lasted only 24 days only. Jayalalithaa Jayaram - born 24 February 1948), commonly referred to as Jayalalithaa, or Amma (translates to mother in English), is an Indian politician and the incumbent Chief Minister of Tamil Nadu, in office since 2015. Previously she served as Chief Minister from 1991 to 1996, in 2001, from 2002 to 2006, and from 2011 to until now. Nripen Chakraborty - April 4, 1905 – December 25, 2004) was an Indian politician and the chief minister of Tripura state from 1978 to 1988. Nripen Chakraborty was involved in the Communist movement in India for six decades. Sudhir Ranjan Majumdar -(1934 – January 4, 2009) was the Chief Minister of Tripura in India from February 5, 1988 to February 19, 1992.from indian national congress. Pandit Govind Ballabh Pant - 10 September 1887 – 7 March 1961)He was made the Chief Minister on 17 July 1937 and was in power till 1939 when all Congress ministries in India resigned.In 1945, the new British Labour government ordered new elections to the Provincial legislatures. The Congress won a majority in the 1946 elections in the United Provinces and Pant was again made the Chief Minister, continuing even after India's independence in 1947.He was the first Chief Minister of Uttar Pradesh in Independent India. Sucheta Kriplani - 25 June 1908 – 1 December 1974), born Sucheta Mazumdar, was an Indianfreedom fighter and politician in Uttar Pradesh, India. She became the first woman to be elected Chief Minister of Uttar Pradesh and in an Indian state. Kamlapati Tripathi - (September 3, 1905– 1990), the writer, journalist, editor and freedom fighter was a senior Indian National Congress leader from Varanasi constituency. He served as Chief Minister of Uttar Pradesh as well as the Union Minister for Railways. Hemvati Nandan Bahuguna - (April 25, 1919 – March 17, 1989) was a Congress Party leader and former Chief Minister of Uttar Pradesh; he later joined Bharatiya Lok Dal and worked with Charan Singh. Nityanand Swami - 27, 1927 – December 12, 2012) was the chief minister of the Indian state of Uttarakhand, named Uttaranchal during his administration. He was the first chief minister of the state, serving from November 9, 2000 to October 29, 2001. Narayan Dutt Tiwari - (born 18 October 1925) is an Indian politician affiliated with the Indian National Congress party. he was thrice Chief Minister of Uttar Pradesh (1976–77, 1984–85, 1988–89) and once Chief Minister of Uttarakhand (2002–2007). Bhuwan Chandra Khanduri - born 1 October 1934) is an Indian politician from bjp party. He has served as Chief Minister of Uttarakhand from 2007–2009 and 2011-2012. Ramesh Pokhriyal "Nishank" - born August 15, 1958) is an Indian politician belonging to the Bharatiya Janata Party. He was Chief Minister of Uttarakhand from 2009 to 2011. Vijay Bahuguna - born 28 February 1947), is an Indian politician who served as the 6th Chief Minister of Uttarakhand. He is the eldest son of Late Hemwati Nandan Bahuguna who was a freedom fighter and eminent politician in India. Hemwati Nandan Bahuguna was also former Chief Minister of Uttar Pradesh. Bidhan Chandra Roy - MRCP, FRCS 1 July 1882 – 1 July 1962) was the second Chief Minister of West Bengal in India. He remained in his post for 14 years as an Indian National Congress candidate, from 1948 until his death in 1962. He was a highly respected physician and a renowned freedom fighter. Bidhan Roy is often considered the great architect of West Bengal, who founded five eminent citities,Durgapur, Kalyani, Bidhannagar, Ashokenagar, Habra. Ajoy Mukherjee - (1901–1986) was the fourth chief minister of West Bengal, India. He hailed from Tamluk, Purba Medinipur district, West Bengal. Siddhartha Shankar Ray - (20 October 1920 – 6 November 2010) was a Bengali politician belonging to the Indian National Congress. He was a prominent barrister, Punjab Governor and Education minister of India He was also the ambassador of India to the United States of America and served as the Chief Minister of West Bengal from 1972 to 1977. Buddhadeb Bhattacharjee - born 1 March 1944) is an Indian politician and a member of the politburo of theCommunist Party of India (Marxist). He was the Chief Minister of West Bengal from 2000 to 2011. Mamata Banerjee - (born 5 January 1955) is an Indian politician who has been Chief Minister of West Bengal since 2011. She is the first woman to hold the office. Banerjee founded the party All India Trinamool Congress (AITMC or TMC) in 1997 and became its chairperson, after separating from the Indian National Congress. CHHATTISGARH - STATE, HARYANA - STATE, JAMMU AND KASHMIR - STATE, JHARKANT - STATE, MANIUR - STATE, MEGHALAYA - STATE,MIZORAM- STATE, NAGALAND - STATE, PONDICHEERY - UNION TEERITORY. TELENGANA - STATE.